Claims: A simple swirl with the brush and the perfect blend of micro pearls will give your skin a seamless, natural glow and flawless luminescence. Enriched with precious minerals mica and silica for a more radiant look. If I am allowed to be cheesy, it was love at first sight. I mean just look at this baby. Oriflame Giordani Bronzing Pearls are available in three variations: Natural Peach, Natural Radiance and Natural Bronze. I have this in Natural Radiance, and boy do I like it. I use this more as a blush, but I often contour my nose with this too. 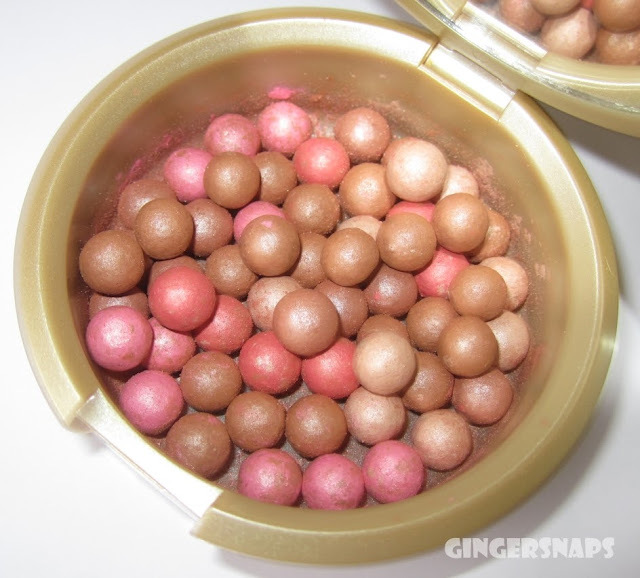 The best thing about these bronzing pearls is that it gives me a beautiful sheen with an even finish and it even wears off evenly. It is a bit on the expensive side, so try to get this when Oriflame offers a discount. But I do think this will easily last me for an year. I love it! So, have you tried anything from the Oriflame Giordani range? Aww ! wish you would have posted more picture and swatches !! would love to see how the color looks. Hey Shanz, Muse is a feature on my blog where I write a snippet on something that I adore. Sorry about the lack of swatches. The last pic shows how gorg it is. And BIG congrats on winning the Indiblog award. A big thank you Shayoni! Indiblog award ? @Shayoni and @karsihma what i am missing here ? and yayyy...congratss karishma!!! many more wins to you!! The pearl balls are amazing. Giordani Gold Body Talc is also good one. The pearls are amazing. I like the Giordani gold talc as well. I think this is really amazing <3 thanks for the review, Dear! this is so pretty.. nice reviews..